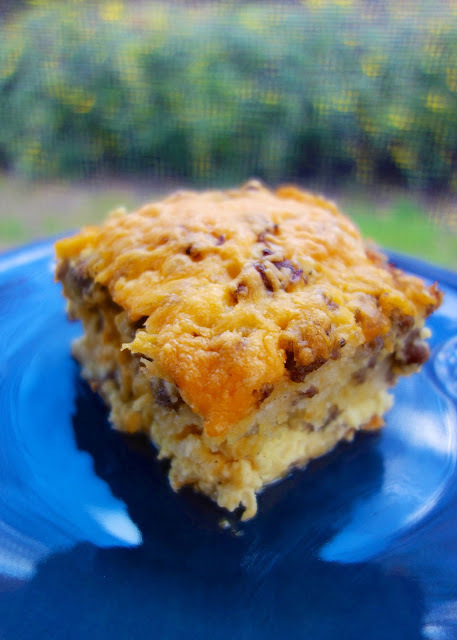 OMG - this is my new "go-to" breakfast casserole! It is very simple and uses frozen buttermilk biscuits - that was new for me. We actually took this to an early tailgate and it was fabulous! Everyone loved this. We topped the casserole with some salsa but some sausage gravy would be good too. This would make a great casserole for Christmas morning. 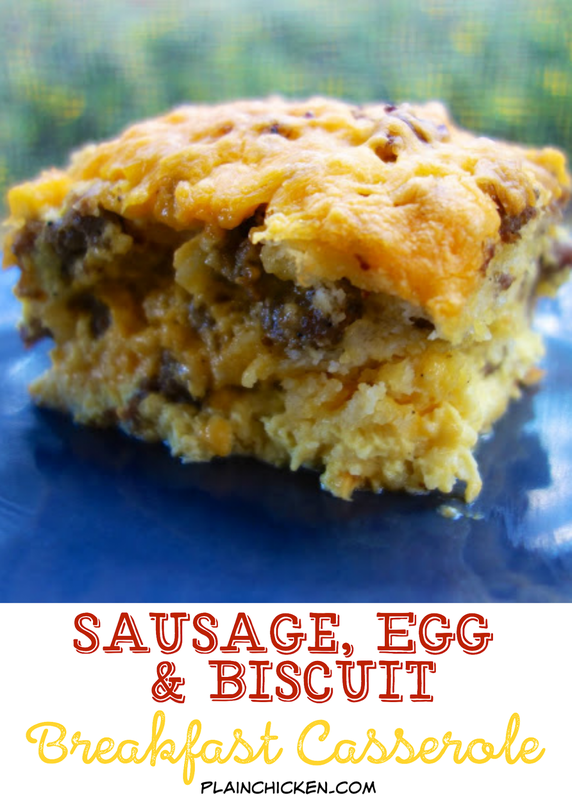 It can be assembled the night before and baked in the morning for an easy breakfast. Preheat oven to 375. Lightly spray a 7x11-inch dish with cooking spray. Brown sausage in pan, breaking into chunks. Drain fat. Whisk together eggs, milk, cream, salt and pepper in a large measuring cup. Set aside. Bake 30 minutes. Sprinkle remaining cheese over casserole and bake until eggs are set, about 10-15 minutes. Let casserole stand 10 minutes before serving. Thanks!! Love that it cooks in 30 minutes rather than 50-60 that most require. It looks delicious! Do you mind sharing what kind of biscuits you used? This looks exactly like something I would luv. I imagine the salsa put it over the top! You are brilliant! I can honestly say that I am printing almost every recipe you post. As a full-time working Mom with 2 young kids, I need fast, yummy recipes that use normal ingredients I have on hand. THANK YOU SO MUCH!! Wonderful! I will totally be making this on the weekend. 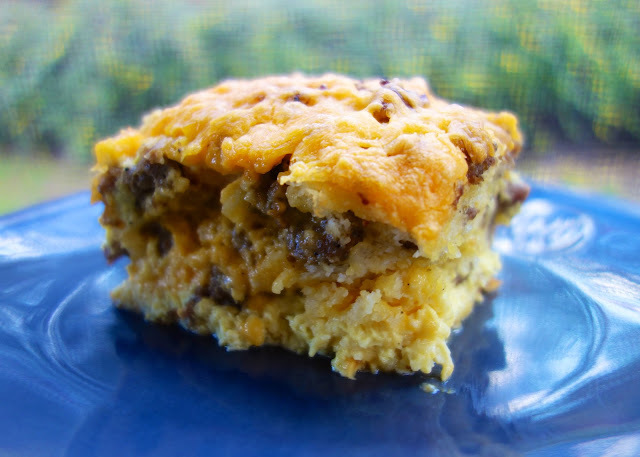 Breakfast casseroles are my favorite and this one looks like a good one I need to try. Will bookmark! Thanks! We do the same thing except it uses plain bread. Yours looks much better and I will try this the next time we make it (probably Christmas). I was so excited to try out this recipe. But when I made it, using slightly thawed biscuits, following the recipe to the tee, The dough was done on the edges and not in the middle. I was very disappointed. It's in the oven now, again, so we're just hoping the top doesn't burn before the middle is done.